The California Independent Film Festival continues through Sunday. And the Legacy Film Festival on Aging, which opens today (Friday), plays through Sunday. A Woman of the Year, Lark, Sunday, 3:30 & Wednesday, 5:50. One of only a handful of Hollywood films that accurately conveys the ups, downs, and sideways motions of romantic love as a long-term commitment(Annie Hall is another). Sexist by today’s standard, this love story between two independently-minded professionals was cutting-edge feminist for its time (or at least as cutting-edge feminist as MGM would allow). And its sense of two people who love each other but can’t easily stay compatible never ages. It also started one of Hollywood’s most famous on-screen and real-life romances–that of Spencer Tracy and Katharine Hepburn. Directed by George Stevens from a screenplay by Ring Lardner Jr. and Michael Kanin. A- Rebel Without a Cause, Pacific Film Archive, Friday, 9:10. The only film where James Dean received top billing is a shallow, silly, melodramatic message picture about what’s wrong with kids these days. And here’s what’s wrong: Their parents don’t spend time with them, and the boys need fathers who are man enough to put the womenfolk in their place. And yet, thanks largely to Dean’s electrifying. frightening, and sympathetic performance, it’s a far better movie than it has any right to be. As a middle-class juvenile delinquent adjusting to a new school, Dean defines the word teenager when it was still a new concept. Of course, he got a lot of help from director Nicholas Ray, and by supporting players Natalie Wood and Sal Mineo as his only friends. In very wide early Cinemascope. Part of the series James Dean, Restored Classics from Warner Bros.
B Lost in Translation, UA Berkeley, Thursday, 9:00. I can’t believe it’s been over a decade since Sophia Coppola introduced us to Scarlett Johansson, and gave Bill Murray his best performance since Groundhog Day. And she did it by making a film in which nothing of note happens. Murray plays an American movie star in Tokyo to shoot a whiskey commercial. Johansson plays the bored wife of a photographer. They sense a bond. And what you expect to happen never does. But that’s okay because it probably wouldn’t happen in real life, either. Coppola allows us to enjoy these people’s company, and their reaction to a foreign culture, for 104 minutes. 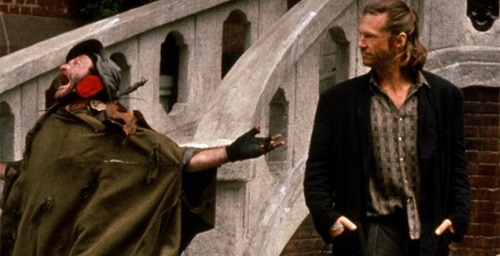 A- The Fisher King, Castro, Sunday, 7:00. Terry Gilliam’s first film from someone else’s screenplay, and his first shot in his native USA, isn’t quite up to his best work. But it’s damn close. Jeff Bridges plays a guilt-ridden former shock jock who befriends a homeless lunatic (Robin Williams in one of his best performances) in hope of redemption. But helping this tragic victim of random violence involves both playing cupid and jumping down the rabbit hole of a brilliant but deeply unhinged mind. Only Williams could sing Lydia the Tattooed Lady and make it sound sweet and romantic. On a double bill with Good Morning, Vietnam, which I recall liking, but not loving, when it was new. A Sons of the Desert, Niles Essanay Silent Film Museum, Sunday, 4:00. 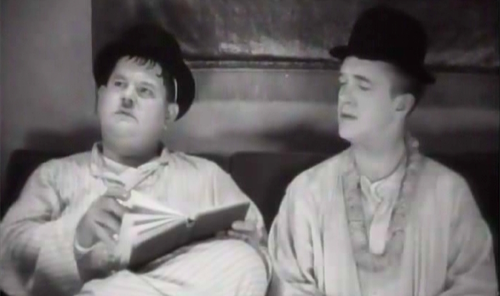 Feature films weren’t Laurel and Hardy’s strong point; something about their humor worked best in the short form. But Sons of the Desert is one of only two exceptions that prove the rule (the other being Blockheads). This simple tale of two married men trying to have a good time away from their wives is loose, leisurely, and very funny. With the short subjects Midnight Patrol and Something Simple. That last one stars Charley Chase, not Laurel and Hardy. B Walking the Camino, Magick Lantern, Friday through Sunday. 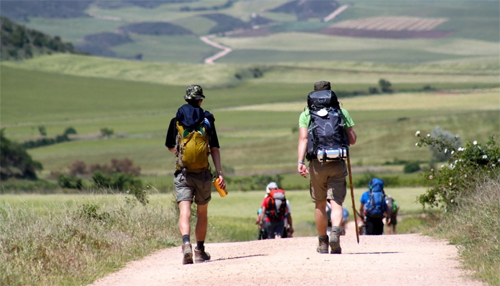 For centuries, religious Christians have walked the Camino de Santiago–a 800km pilgrimage across northern Spain. Today, spiritual seekers of all kinds, as well as those just looking for adventure, take the arduous route. This documentary follows a handful of walkers, each going for their own reasons and finding, if not what they were looking for, than at least something worth knowing. The film is pleasant, and provides a sense of what the journey might be like (obviously, no film can recreate the actual experience). Warning: You’re likely to come out of the theater ready to make the journey yourself. A Spartacus, Pacific Film Archive, Saturday, 7:00. This very fictionalized version of the famous Roman slave revolt is simply the most powerful, intelligent, and coherent toga epic from the golden age of toga epics. And yes, I know that sounds like weak praise, but it isn’t. Stanley Kubrick’s only work as a director-for-hire doesn’t give us the glory of Rome, concentrating instead on the horror, cruelty, and exploitation of an empire. Star and Executive Producer Kirk Douglas gave Dalton Trumbo a well-deserved screen credit, which helped end the blacklist. For more, see Cemeteries and Gladiators, On the Moral Dilemma of Gladiator Movies, and How I lost my love for Stanley Kubrick. Part of the series Eyes Wide: The Films of Stanley Kubrick. B+ The Iron Giant, Balboa, Saturday, 10:00am. 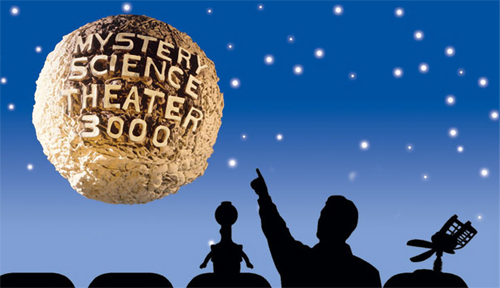 The young hero of Brad (The Incredibles) Bird’s first feature befriends a massively-huge robot from outer space. Hey, Steven Spielberg’s Elliot only had to hide the diminutive ET. The robot seems friendly enough, but there’s good reason to believe he was built as a weapon of mass destruction. Using old-fashioned, hand-drawn animation with plenty of sharp angles, Bird creates a stylized view of small-town American life circa 1958 that straddles satire and nostalgia, and treats most of its inhabitants with warmth and affection. A good movie for all but the youngest kids. 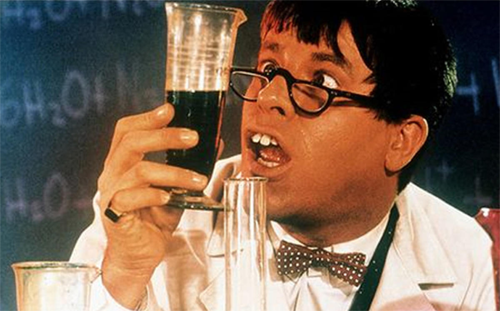 C- The Nutty Professor (1963 version), various CineMark Theaters, Sunday (matinee only) and Wednesday. As a young child, I adored Jerry Lewis, but as I matured I found his comedy grating and tremendously unfunny. Today, The Nutty Professor is considered his masterpiece, and I suppose it is–in the sense that it’s not all that awful. The basic concept–a very clever twist of Jekyll and Hyde–is audacious and thought-provoking, especially for what is basically a children’s movie. But the execution is so clumsy and clunky that to a large degree, it sinks the wonderful concept. C+ Universal Horror Double Bill: The Black Cat & Dracula (1931 version), Stanford, Saturday and Sunday. Low-budget auteur Edgar G. Ulmer made The Black Cat for very little money, and it looks it. But this silly story of revenge, lost honeymooners, a very modern spooky castle, and fear of cats offers a good share of laughs, some of them intentional. Dracula is a much more important movie–it started Universal’s famed horror series–but it really doesn’t deserve its classic status. The picture suffers from stilted blocking and too much mediocre dialog–common faults in early talkies. But it has a few wonderful moments, most of which are wordless. Each of these films would earn a C+ on its own.